BANGKOK (AP) — The people of Thailand on Saturday marked the 88th birthday of their king, the world’s longest-reigning monarch – but with their once-vigorous leader in a hospital and unseen in public for three months, the celebrations were the most subdued in memory. 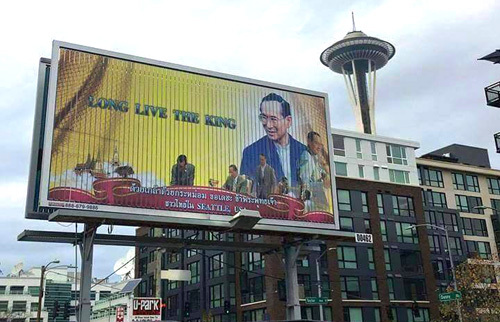 However the Seattle Thai community posted billboards commemorating his birthday. King Bhumibol Adulyadej looked frail on his last appearance before the general public on Sept. 1, when he was taken on a brief tour of the Bangkok hospital where he has spent most of the last six years. His most recent ailment was a lung infection that required him to be fed intravenously and use a machine to aid his breathing. Many public activities were being held for the royal birthday, but there were no joyous celebrations of the type that used to be held before the decline of the king’s health. One major gathering point this year was outside the hospital that has become his de facto palace, where well-wishers came to offer their prayers. The king’s other medical issues in recent years have included excess fluid in the brain and an operation to remove his gallbladder. A somber reminder of his generation’s passing came Saturday morning with the death of 96-year-old former Foreign Minister Siddhi Savetsila, a member of the Privy Council, the king’s personal advisory board. While he is a constitutional monarch with no formal political role, Bhumibol — King Rama IX — has generally been regarded as Thailand’s unifying figure. His intervention during major political crises is generally seen as having been key to restoring the status quo. Before the decline in his health, Bhumibol’s birthday had also been the occasion for a much-anticipated annual speech in which he would speak his mind to exercise his authority as the country’s moral leader. Love of the monarchy is almost seen as the definition of Thainess. But it is not so clear whether the people’s strong devotion for the king will be transferred to his son and heir apparent, 63-year-old Crown Prince Vajiralongkorn, who does not have his father’s record of public service. Social and political schisms that have sometimes led to violence over the past decade have added to the air of uncertainty about what may happen after Bhumibol’s reign is over. “I don’t know what to think,” said Thaweewat Chongsuanoiy, a banker. He was wearing a “Bike for Dad” T-shirt promoting a mass cycling event scheduled Dec. 11 under the prince’s auspices to honor the king.